Originally uploaded by ulterior epicure. Quite a few years ago, I bought a jacket-less cookbook at a used book sale. With the exception of a coffee cup stain on the cover, it was in perfect condition. I thumbed through the recipes with passing interes, noting the simple, yet beautiful photographs, and shelved it. Well, life has a funny way of tying things together. During the first year of graduate studies at the University of Michigan in Ann Arbor, Michigan, my ever-vigilant foodie antennae picked up a little restaurant about 20 minutes away in the sleepy town of Chelsea (which happens to also be the home of Jiffy Corn Muffin mix, believe it or not). A few of my professors used to ride their Harleys over there on weekends for brunch. Back home, I dug the jacketless cookbook out of *the pile* and took a good look at the spine: “The Common Grill Cookbook” by Craig Common. It’s been a few years, and I’m finally getting around to cooking out of the book. Page 185 yields a most righteous summer recipe: Peach, Blackberry & Blueberry Cobbler; just what I was looking for. 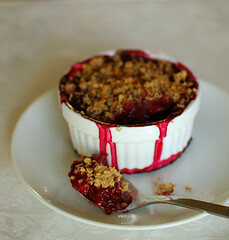 Despite the recipe’s name, this dessert is actually what I think is a “crisp” (or “crumble,” for you Brits out there). The topping is made from a wonderfully toasty mix of ground toasted pecans, brown sugar, cinnamon, and rolled oats. In large bowl, combine all ingredients. Divide evenly among six 8 oz. ovenproof baking dishes and sprinkle with Streusel Topping. Bake in oven for 30 minutes, or until topping is golden. Best served warm, topped with your favorite ice cream. Place all ingredients in the bowl of a food processor, fitted with a metal blade, and pulsate until the butter is thoroughly combined and mixture is the size of peas. ~ by ulterior epicure on August 27, 2007.